News | Fort Wayne Children's Choir | Come Sing With Us! The months of November and December find all of the performance ensembles singing at various venues. 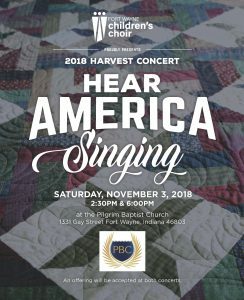 Starting with the Harvest Concert, the singers will perform on their own or in collaboration with another arts organization. The FWCC places all of the events under one heading: Angels Sing. The Fort Wayne Children’s Choir ensembles will perform a holiday program at five different assisted living residences, in addition to private holiday engagements. We hope you join us at one of the above performances! Happy holidays! The Preparatory Program is designed for younger students, 6-7 years old, with little to no choral experience. Directed by a master music educator, children learn the basics of being in a choir without the pressure of performance. Singers learn rehearsal etiquette and the foundations of singing in a relaxed and fun atmosphere. No placement session is required. WHEN: The next session begins November 12. All classes are on Mondays. 4:45-5:30 pm. WHERE: Holy Cross Lutheran School, 3425 Crescent Avenue. WHO: The Prep Class is under the direction of Mrs. Susan LaCroix, who also directs the Apprentice Choir. Mrs. LaCroix teaches at Holy Cross Lutheran School. HOW: Register through the FWCC office, (260) 481-0481. No audition is needed for the Preparatory Program. PERFORMANCES: Singers in the program give an informal concert for parents at the end of the 8-week session. COST: $99/8-week session; Payment plans are available. Tickets: No tickets are required for these performances, but donations will be accepted during the concert. Each fall, we host the Music Educator’s Workshop for teachers from Northeast Indiana and Northwest Ohio. This program brings dozens of educators together to learn a variety of music education methods from well-known clinicians. The workshop is held in the Rhinehart Music Center on the campus of Purdue University Fort Wayne and music students are invited to participate, as well. This year, we welcome Henry Leck, Founder & Conductor Laureate of the Indianapolis Children’s Choir, to Fort Wayne on Tuesday, October 16, 2018. Mr. Leck will present the workshop, “The Boy’s Changing Voice: Take the High Road.” The workshop begins at 4:30pm and will conclude with a reading session from 6:45-7:30pm. A boxed dinner is provided. 2018 marks our 45th season. This new logo is a nod to the past and our original logo, with a look to an exciting and vibrant future. Special thanks to American Advertising Federation Fort Wayne and the winning Pitch team who created this logo and all of our marketing materials. Thank you to our marketing team volunteers for helping us implement this change and our board of directors for supporting this new marketing direction. First Steps in Music returns for some select dates in August and throughout the Fall. First Steps in for children 0-3 and will help them become tuneful, artful, and beatful. All “teaser” classes and fall classes are free and open to the public. Children 0-3 years old, accompanied by an adult, are welcome to attend any, or all, of the sessions. The goal of First Steps in Music is to enable all participants to reach their full potential in singing, vocabulary, and movement skills, with an emphasis on developing sensitivity to the expressive qualities in music. Each class is designed to be playful and enjoyable to children, while providing a carefully planned curriculum that includes developmentally appropriate activities. Children are not taught formally about the specifics of music, but rather they play with music through a series of eight well-rounded activities based on the First Steps in Music curriculum. 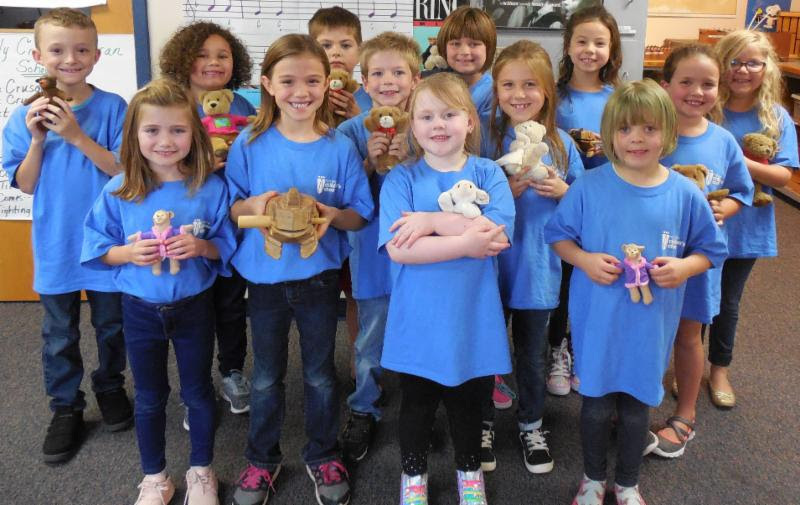 The Fort Wayne Children’s Choir offers First Steps in Music classes to children ages 0 to 3 years old in coordination with the Allen County Public Library. Through the 8 basic activities included in classes based on the First Steps in Music curriculum, children and their parents/caregiver experience singing, creative movement, simple instruments, finger-plays and more with the help of the rich collection of traditional songs and rhymes from past generations. The Fort Wayne Children’s Choir (FWCC) seeks a Development Director to contribute to the vision of the organization. The FWCC is searching for a highly organized, talented, energetic individual committed to supporting the mission of the organization. The Fort Wayne Children’s Choir has been a vibrant part of the Northeast Indiana community for 45 years and strives to provide a choral program exemplifying artistic and educational excellence for children from diverse backgrounds. The successful candidate must be a strong leader who is an outstanding communicator and demonstrates strong motivation and organizational skills and exhibits passion for working with children. She/he will invest time both in and out of the office and be visible in the community. Responsible for creating and overseeing the implementation of strategic approach to fundraising, including donor cultivation, major gifts, corporate sponsorships, and event coordination. Hours are flexible. The Development Director will work 24 hours per week, with the understanding that the position has the potential to grow with the successful candidate. Meeting times with donors, concert performances, and Board and Committee work may occur outside of regular business hours. Deadline for all application materials is July 20, 2018. Please state Development Director Search in subject line of the email. Questions may be directed to Jonathan Busarow, Executive Artistic Director, at 260.481.0481 or via email at jbusarow@fwcchoir.org. Each year, it is bittersweet to see our seniors graduate. This year, we are saying good-bye to 13 singers, one of the largest senior classes we have had. These 13 singers represent 100 years of membership in the FWCC. We have watched many of them grow up in the choir, starting with Apprentice Choir, and now graduating as members of the Youth Chorale. We are honored to know them and wish them the best of luck. We invite youth in grades 3-12 to participate in our open auditions for the 2018-19 season. Auditions are free and open to any singer interested in pursuing their love for singing and passion for choral excellence. 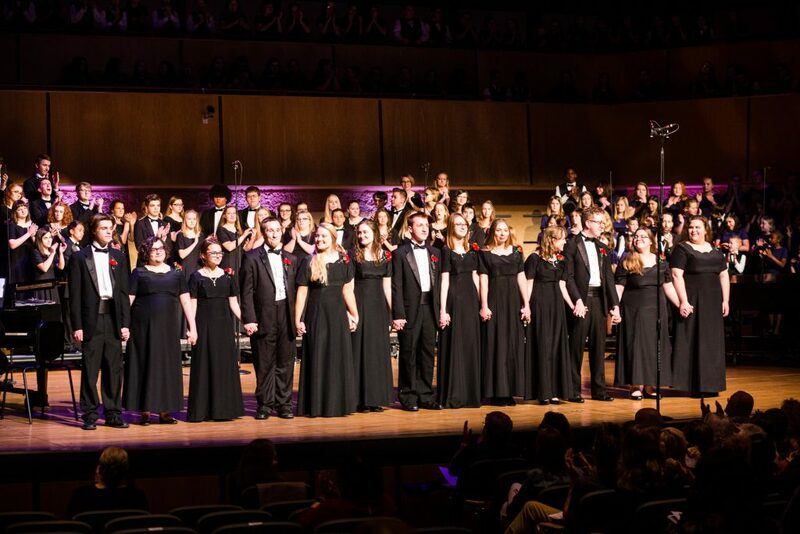 All ensembles of the FWCC sing at season concerts, community festivals, and civic events, and collaborate with many other arts organizations, such as the Fort Wayne Philharmonic, Fort Wayne Ballet, Heartland Sings, and others. Students will be placed in the choir that best suits their needs. FWCC offers participation assistance for qualifying families. The Audition: Potential FWCC members are tested on pitch matching, rhythmic skills, and music theory. The audition session is meant to be relaxed, fun, and non-intimidating. An audition takes approximately 30 minutes and usually includes 4-6 children of the same age. A parent information session is conducted at the same time. Following the session, the level of choir is determined for which the singer is ready. The child/parents/guardian is contacted with more information following the audition decision process. Singers may participate in a Fort Wayne or Whitley Community audition and designate at that time where they want to participate. What an unusual winter! Mother Nature couldn’t seem to make up her mind as we experienced both extreme cold and Spring-like temperatures, often within a two-week span. As we get closer to Spring, we hope you are thinking about your gardening projects–flower beds, vegetable gardens–or perhaps gifts for Mother’s Day. The FWCC plant sale is a perfect way to begin planning! Continuing our partnership with Broadview Florists and Greenhouse, 5409 Winchester Road, owners Mike and Catherine Waters guarantee great service and the finest variety of plants and flowers. We are selling coupons below retail for the following items. A portion of the proceeds benefits our programs. geraniums, New Guinea impatiens, begonias, spike, wave petunias, coleus, grasses, basil, thyme, oregano, and many more! artemesia, aster, astilbe, campanula, coreopsis, delphinium, dianthus, digitalis, hosta, iberis, iris, phlox, rudbeckia, viola, and many more! petunias, marigolds, snapdragons, impatiens, begonias. peppers, zucchini, tomatoes, broccoli, cauliflower, watermelon, and more! Geraniums – pink, red, fuchsia, lavender, and many more!